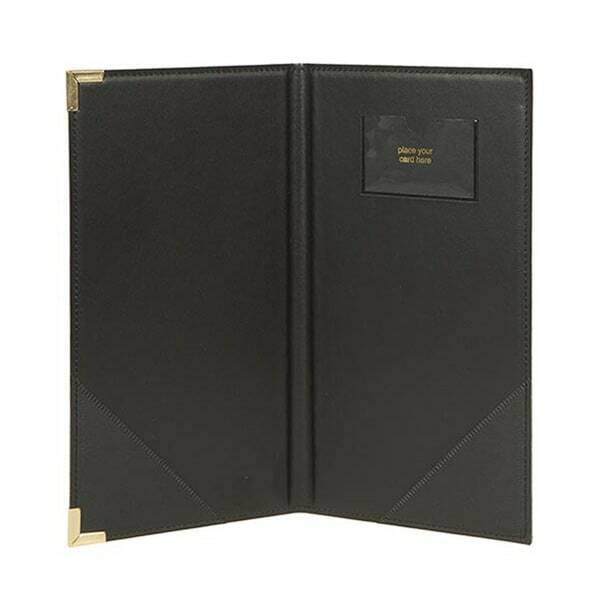 The American Metalcraft MCCRBPBL bill presenter comes in black, with gold accents on its corner reinforcements and lettering to create an upscale look. The faux leather of the folio adds to that elegant appearance. Two plastic inserts hold receipts, cash, and checks, while a card sleeve prevents credit cards from falling out. An elastic cord adds more security to prevent important contents from falling out. The American Metalcraft MCCRBPBL bill presenter measures 5 inches wide by 9 inches tall. "I love these little booklets and store important papers in them"
"I use the check presenters to store important papers"